Covering all 90 events that Phil photographed “for the folks back home” between 1950 and 1962, and including his full collection of more than 1250 supremely evocative (and often vanishingly rare) images, ‘Inside Track’, the Collector’s Edition, comprises two volumes lavishly produced on the finest Italian art paper. 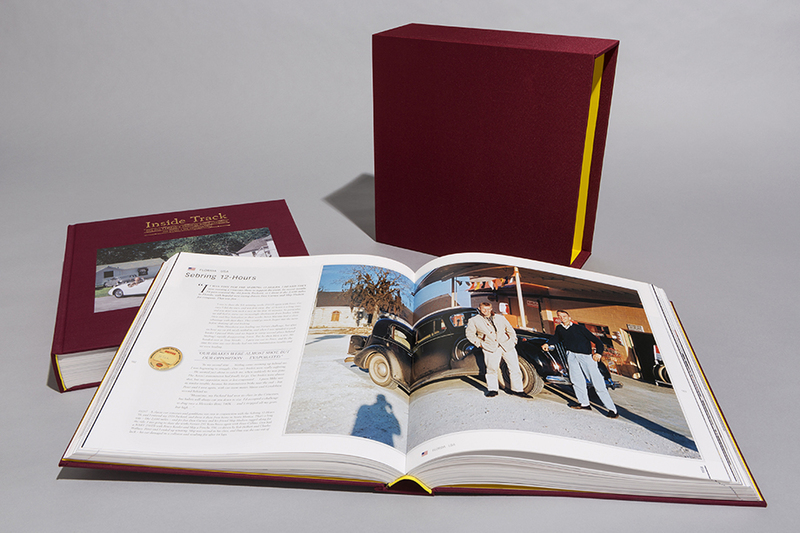 Both volumes are hardbound with cloth-covered cases, inset front and back with photographs and presented in a single cloth-covered slipcase. Volume 1 covers the years 1951 to 1956, from Phil’s visit to Pikes Peak as a spectator in 1951, through his early minor-league races around the USA, leading to the start of his international racing career on the Carrera PanAmericana in Mexico in 1952 and at Le Mans in 1953. Volume 2, meanwhile, covers Phil’s great years with Ferrari from 1957 to 1962, a magical era for motor sport during which he famously won the Le Mans 24-Hours three times and, of course, the Formula 1 Drivers’ World Championship in 1961. Included in both volumes are many behind the scenes photographs taken at the great circuits of Monaco, Monza, Rouen-les-Essarts and of course Le Mans, and also at such lesser known but wonderfully exotic sports-car-racing venues as Havana, Buenos Aires, Hawaii, Caracas and beyond. Neither is behind the scenes development ignored, as Phil’s camera also captured numerous images of testing on the fabled Modena Aerautodromo. And then he takes us to the Bonneville Salt Flats for Land Speed Record running with MG. Photographed almost exclusively on Kodachrome, ‘Inside Track’s photographic colour reproduction has to be seen to be believed. Interviewed at length by his longstanding friend Steve Dawson, son Derek and renowned motor sport historian Doug Nye, Phil provided fully detailed and often hugely entertaining captions for every gorgeous image. A comprehensive list of his race appearances and results will also be included, together with a full index covering each volume. The Collector’s Edition is available now, ready for immediate despatch worldwide. The Collector’s Edition can also be ordered in combination with The Racing Autobiography, offering a saving of $60.00 or more. Click on BUY NOW to order the Collector’s Edition directly – with or without the Autobiography – or visit CHECK OUT to see other possibilities.